What is really going on in Jeremy Corbyn's Labour Party? An open-air meeting and the changes in a ward branch give some clues. "Most MPs opposed to Corbyn appear willing to discount this surge, even though it is unprecedented for the Labour Party in recent times." 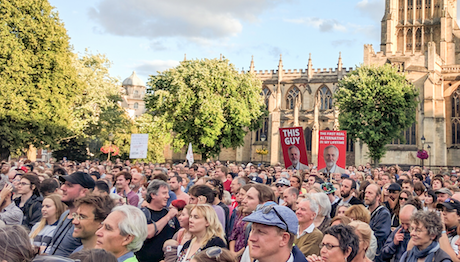 Jeremy Corbyn leadership rally in 2016. Credit: Wikimedia/PaulNUK. Some rights reserved.These columns have occasionally strayed from their usual territory of international security to look at elements of domestic British politics, especially since the unexpected rise of Jeremy Corbyn to the leadership of the Labour Party. The current leadership contest, which climaxes on 24 September, and the intriguing state of the party as a whole, makes another contribution to this mini-series seem timely. (For earlier contributions, see for example: "Jeremy's Corbyn's first hundred days" [19 August 2015] ; "Jeremy Corbyn's first 100 days, revisited" [17 December 2015] ; "Jeremy Corbyn, the future not the past" [28 April 2016] ; and "What Labour should do now" [14 July 2016]). If the bookmakers are right, Mr Corbyn is almost certain to be re-elected leader, and probably by a substantial majority. That is supported by an opinion poll that shows him with an increased lead compared with last year, and puts him ahead in all three sections – full members, supporters and trade-union affiliates. Indeed, so much is this presumed victory now taken as read that attention has moved on to what the majority of Labour members of parliament opposed to him will do next. There is no consensus on this among the London-based commentariat apart from an assumption that only a few will be prepared to sink their differences and work with him. Taking this as accurate, it is worth paying more attention to what is happening more widely within the party, especially in terms of the further increase in membership to well over 500,000. Put bluntly, most MPs opposed to Corbyn appear willing to discount this surge, even though it is unprecedented for the Labour Party in recent times. Some see it as little more than a cult of 'true believers', and others see the increased membership as made up of 'fair-weather' friends. This, though, might not be wise and more importantly might be missing what is going on below the surface. Anecdotal evidence may not be of the highest quality in terms of analysis but it has its uses, especially if it appears relevant to a wider trend, so please bear with me if I cite a couple of recent pieces. Neither my wife nor I had previously heard Jeremy Corbyn speak in public so we took a day off three weeks ago and caught a train to Derby to go to a lunchtime meeting. This was in the height of the holiday season with many people away, but it was a beautiful day and the shopping area of the city was quite busy. The meeting was at midday on Cathedral Green, about half a mile from the city’s main commercial centre. We got there over half an hour early to find little evidence of an impending meeting aside from a few people gathering. Rapidly, though, a small platform was assembled along with a public-address system, the media turned up as did sellers of various radical papers, and a crowd began to gather that swelled to several hundred in a matter of minutes. There was no evidence of crowds being bussed in, rather people simply came on foot, mostly from the city centre. The meeting was well organised, started almost on the hour and by the time Jeremy Corbyn started speaking, to a very warm welcome, around 1,000 people had arrived. The meeting appeared to have been organised at quite short notice and publicised largely by social media. It did not have the style of an evening gathering of the faithful in a large hall, but was simply an open-air opportunity to hear Corbyn. That he could gather so many people in the middle of a working day at the height of the holiday season is interesting in itself. The crowd included plenty of young people, with many prams and push-chairs evident. I doubt that any other politician could have attracted such a crowd at the present time, nor for many years, at least in the English midlands. The mood was positive, appreciative but not 'over the top'. It was as far from a cult as you could imagine. The second example concerns one Labour Party branch in a constituency in the north of England. It is a marginal seat that has swayed from Conservative to Labour and back again in recent years and was won back for Labour in 2015 by a hard-working candidate who has proved to be a diligent and effective MP. The constituency has six wards, three of them in an urban area with a weak economic base and plenty of problems. These wards have some UKIP support but the majority will tend to lean towards Labour if they vote at all. The other three are semi-rural with clusters of towns and villages scattered over quite a wide area. Forty or more years ago these wards were on the fringes of one of the northern coalfields and would have been evenly split between Labour and Conservative, with some Liberal Democrat presence as well. In recent decades, though, there has been some degree of gentrification resulting in a greater likelihood of voting Conservative, also with a UKIP presence and a steady decline in Liberal Democrat support. I learned recently of the state of one Labour Party ward branch in this area, and it really is rather interesting. The three councillors on the metropolitan council from this ward are currently Conservative, though it has a strong Green presence and far less support for Labour. Indeed the last time Labour in this ward had serious representation even on the local parish council was in the late 1990s, at the height of Tony Blair’s popularity. Fifteen years ago the ward branch had about 70 members but this slowly declined to just 37 by the beginning of 2015. Immediately after the general election in May that began to pick up, as if some people were so appalled at the result that they thought they really had to get involved or at least show some commitment. Then, when Jeremy Corbyn’s campaign for the leadership began to take off last summer the numbers rose and continued to do so after his election in September, exceeding the Blair era high and heading for 100 by the end of the year. This ward is not a noted haunt of the hard left, far from it; neither does there appear to be any kind of cultish support for Corbyn, though what he seems to stand for certainly goes down well with people who have joined the party from many different backgrounds. What is even more interesting is that the growth has continued since the leadership challenge, and now stands at 140, close to quadruple the size of eighteen months ago. To emphasise: this is not a city-centre ward, there is not a large student population, and any longer-term tradition of Labour support stemming from coal-mining days has long since diminished. Does this help clarify what is going on? I’m not sure, but there are four points worth making. 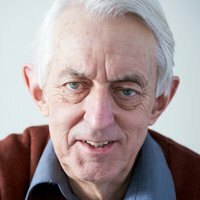 First, whatever the state of relations among Labour MPs in Westminster, the toxicity of the interactions and the bitter recriminations, this has coincided with the party “out there” growing to be the largest political party in western Europe. Second, that growth is most definitely not coming just from hard-core lefty entrists deftly controlling malleable and idealistic new members. There certainly will be some of the former, and they will do their best, but they will have an uphill struggle to have much of an impact. Third, it is hardly true to describe the increased membership as being dominated by fair-weather friends. Such people typically join an organisation when it is doing very well and leave when things get tough, but the huge increase in numbers of new members coincides with Corbyn and Labour under constant attack, and with Corbyn ridiculed in much of the media on a daily basis. It is therefore far more a case of foul-weather friends who have joined when times are singularly difficult. So Corbyn seems to have attracted perhaps a 100,000 more potentially loyal members than Blair did at his peak. Fourth, the Conservative government under its new leader has junked the fundamentals of the Cameron-Osborne mantra – “there is no alternative” (to austerity) – one of the central points that the Corbyn group have been making for over a year. On the face of it there may be plausible explanations for all of this, but after watching Labour Party politics for more than fifty years I have this feeling that an awful lot of us haven’t got a true handle on what is going on underneath the surface. If so, then Jeremy Corbyn may be with us for quite a long time yet.